Keeping our military families in mind this weekend. While 25 Republicans supported the proposal, 22 opposed it. Forty-eight Democrats and two independents voted for the bipartisan measure, drafted by two Vietnam veterans, Senators Jim Webb, Democrat of Virginia, and Chuck Hagel, Republican of Nebraska. The proposal on veterans’ benefits was approved by a veto-proof majority, with support from conservative Republican senators including Saxby Chambliss of Georgia, James M. Inhofe of Oklahoma and John Thune of South Dakota. The bill now goes back to the House, where its future course is somewhat uncertain. The House had endorsed a similar expansion of education benefits for veterans, but has also adopted policy measures to speed the withdrawal of American troops from Iraq. The Senate rejected efforts to limit the president’s hand in Iraq. Repeated, long deployments have put unsustainable stress on troops and pose significant risk to the all-volunteer military. Some 1.6 million troops have served in Iraq and Afghanistan since 2001; many of them have deployed to the war zone for three or four tours. Fifteen-month combat tours, followed by only 12 months of home leave, put incredible stress on families and make it hard to train for the next mission. President Bush and the Congress favor expanding the number of ground forces. The Army has already had to reduce its standards to meet recruitment quotas. In 2007, only 79 percent of recruits had high school diplomas, down from 92 percent in 2003. The Army is also granting an increasing number of so-called “moral” waivers — given to recruits with criminal histories ranging from marijuana use to felony convictions. Retaining the best and most experienced war fighters is getting harder. The Army has only 83 percent of the majors that it needs. It has offered bonuses of up to $35,000 to keep captains from leaving, promoted junior officers at an unprecedented rate and allowed senior officers to serve beyond mandatory retirement dates. The National Guard, whose primary task is to protect the homeland and respond to disasters, has only about 61 percent of its equipment because the rest is overseas. The Pentagon’s acquisition process is so flawed that dozens of the most costly weapons program are billions of dollars over budget and years behind schedule, according to a recent study by Congress’s Government Accountability Office. Defense Secretary Robert Gates recently has been urging troops to seek treatment instead of trying to ignore the problem. "You're tough and you go into the hospital when you receive a physical wound," Gates said on a visit to a Texas Army post. "That doesn't mean you're weak in some way, and so why wouldn't you when you've received a psychological wound? It's the same difference. They're all wounded." To make it easier for soldiers to seek treatment, Gates has announced a change on the application for a government security clearance that asks: In the last seven years, have you sought mental-health counseling? That question will no longer be asked. National Public Radio reported that studies show that the fear of losing a security clearance is one of the biggest reasons that combat veterans do not seek mental-health care. Under the new policy, applicants who seek mental-health treatment could still obtain clearances if the treatment was for problems stemming from service in a combat zone. Earlier this month, the American Forces Press Service reported that Gates is willing to consider awarding Purple Heart medals to combat veterans suffering with PTSD. John E. Fortunato, who runs the Recovery and Resilience Center at Fort Bliss, Texas, told reporters that awarding the Purple Heart to PTSD sufferers would go a long way toward chipping away at prejudices surrounding the disease. Because PTSD affects structures in the brain, it's a physical disorder, "no different from shrapnel," Fortunato said. "This is an injury." Last year, a firestorm erupted when it was found that 24,000+ OEF/OIF veterans had been booted out of the military with Personality Disorder discharges. PD (once labeled "Section 8") discharges are a quicker and more cost-efficient way of dealing with service members who are exhibiting problematic behavior. The problem, of course, was that some of the discharged were combat-injured Purple Heart recipients who may have instead been coping with PTSD, a fact that would allow them access to VA health care benefits to treat their condition. This week, we've moved from the military's diagnoses of Personality Disorder over PTSD to a Texas VAMC PTSD program coordinator advising that Adjustment Disorder diagnoses should be handed out over that of PTSD. The reason given? Saving money. Happy Armed Forces Day, everyone. On Thursday, I buttoned up my semester at NIU. 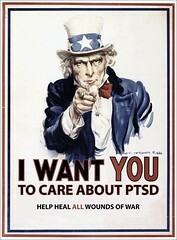 This weekend, I'm busy preparing for my upcoming "Healing the Hidden Wounds" veteran symposium presentation. Organized by Nashville Public Television, NAMI Tennessee and YMCA/Restore Ministries, the summit aims to raise awareness of existing resources for active duty personnel and veterans from all branches of military service and to begin forging partnerships between the Veterans Administration and community mental health agencies.